I'd like to welcome author Christine Lemmon to Book Club Exchange, a regular feature on Booking Mama which highlights anything and everything book club-related! 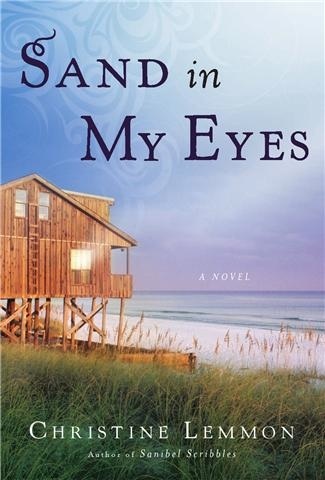 Her most recent book SAND IN MY EYES sounds like an ideal summer book club pick! Some of the themes it explores include motherhood, marriage, self-discovery and friendship. Plus it's set on the beautiful Sanibel Island. Today, Ms. Lemmon wrote a very honest guest post about her first experience with a book club. As a reader and book club member, I love getting this insider's glimpse into an author's feelings! Writing is intimate to me. It’s intimate because it has always been a part of me—writing in my diary since I was a little girl. When writing a novel, hardly do I talk about what I am writing and my husband is usually the only one I allow to read my manuscripts. When a copy of the finished book arrives at my house, I can hardly open it. What if no one likes it? For weeks I hide under a rock of vulnerability, ignoring my husband as he reminds me that now it’s time to promote! When I got my first invitation as an author to attend a book club in which the group of ladies had read one of my novels, I sat in my car outside the house where they were meeting, nervously flipping through the pages of my own book. What were they going to say to me? How could Lydia keep that secret from Josh, and why didn’t you have Jaden run, run, running across the country after Ava? This invitation to attend the book club had me revisiting my story as if I were revisiting loved ones who died long ago. I had felt sad when I finished writing the story and now, I missed my characters—all that time spent creating them and working through the issues of their lives. Filled with emotion and trepidation, like a person entering a courtroom ready to face interrogation, I entered the living room where the twenty women were waiting for me. But one after the next, they came up welcoming me with hugs, handshakes, kisses on the cheek, telling me their favorite quotes, sharing with me stories from their lives in relation to what they had read in my book, and how this character spoke to them personally, and that theme inspired change in their life and this went on until one lady was wiping tears from her eyes and so was I. Books do this to people. They bring us together. And some books tear us apart. Interacting with the members of this book club, hearing their reactions and seeing their emotions have made me a better writer. I have learned that no matter the age, background, financial status or education of a person, we are all similar when it comes to wants and dreams, heartache and sorrow. I left the discussion that night feeling a unique attachment to this group, the kind that only a writer feels when she encounters a roomful of her readers. And I took with me a new sense of accountability for what a write. If what I write is going to take up hours, days, and nights from a person’s life, then I want to write something worthy of their time and if nothing else, add a little beauty to their life. I have since had the opportunity to attend numerous book clubs in my area. Sometimes I still think my writing is an intimate part of me but it isn’t. It’s no longer something locked up in the pages of my diary but rather a part of my heart and soul that I am sharing with others. Due to an influx of book clubs nationwide selecting my novels for their discussions I have recently launched a brand new website that includes a letter to groups, ideas for themed get-togethers, and of course, discussion questions I came up with that should spur meaningful conversations. For those groups far away from where I live, I am happy to answer emailed questions so I can in a way be a part of the experience. For more on Christine Lemmon and her books, visit: www.christinelemmon.com or find her on Facebook and Twitter. 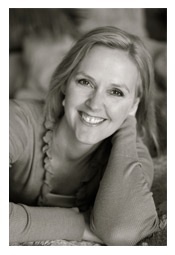 Christine Lemmon is the author of three novels - SANIBEL SCRIBBLES, PORTION OF THE SEA, and SAND IN MY EYES, and the gift book, WHISPER FROM THE OCEAN. She has lived all over the country writing for radio, newspaper, television and magazine. She currently lives with her husband and three children on Sanibel Island, a subtropical island off Florida's Gulf Coast, which is the setting for her novels. She gets most of her inspiration while biking, kayaking or walking around the island, and watching sunsets with her family, but then she must hold her ideas until night, when her children are sleeping and she can write. Christine is a frequent speaker at luncheons, book clubs and women's groups where she discusses writing and creativity. She is writing her next novel. Her website blogs appear as columns in the ISLAND SUN. Giveaway Alert: Between today and July 1 when SAND IN MY EYES releases, Christine Lemmon is giving away some of the best beach books of summer! Pre-order Christine Lemmon's new book, SAND IN MY EYES, from Amazon now, email your receipt to jclemmon@gmail.com with subject line Beach Bag Giveaway, and you'll be entered to win a beach bag full of 7 fabulous new summer beach reads including SEVEN YEAR SWITCH by Claire Cook, THE ISLAND by Elin Hilderbrand, FLY AWAY HOME by Jennifer Weiner, THE ONE THAT I WANT by Allison Winn Scotch, THE OPPOSITE OF ME by Sarah Pekkanen, THE NOBODIES ALBUM by Carolyn Parkhurst, and THIN RICH PRETTY by Beth Harbison. Added bonus: She's throwing in a sweet pair of women's Oakley sunglasses and a $50 Amazon gift card for even more reading fun. I am so grateful to Ms. Lemmon for sharing some of her book club experiences with us. And don't forget to check out her huge giveaway! If you are interested in participating in a future Book Club Exchange, please contact me at bookingmama(at)gmail(dot)com. It's nice to hear about book clubs from an author's perspective! I'm nervous too when speaking to an author about their book because I know it has to be such a big part of who they are. God bless her! Knowing that she was so nervous to talk to a book club, or when a book is published, well, it makes me want to give her a hug! I guess I need to get on the bandwagon and read her books. I bet it was nerve-wracking to go to that first meeting. But I can also see how interacting with readers can make one a better writer.